Designed to be used at boat builders and repair yards to protect the gelcoat deck and hull surfaces. 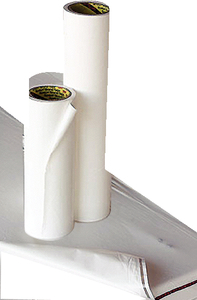 provides temporary protection of non-skid gelcoat surfaces on decks and other sections of fiberglass boats. During assembly of refurbishment and in the showroom, this product helps prevent damage and avoids costly repairs and clean-ups. White vinyl material. 4 mils. Non-skid and very tacky. For indoor or outdoor use.